To add a folder, go to the Add menu and select Folder. In the New Folder dialog box, type in a name for the folder in the Name field. 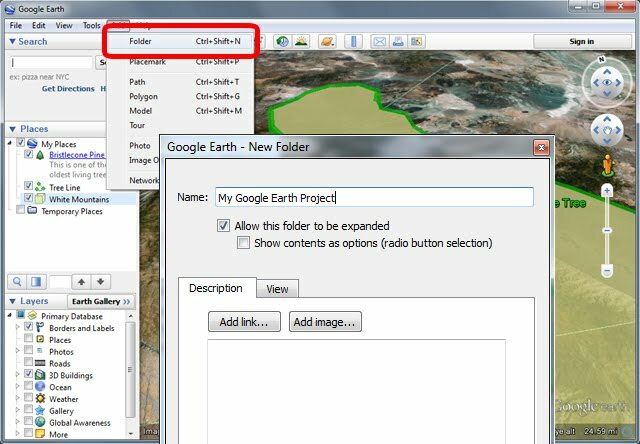 In this example, we typed "My Google Earth Project". Click OK. Your new folder is added to the Places panel. 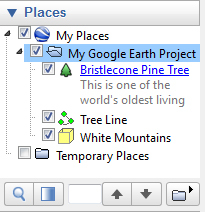 Click-and-drag each place (your placemarks, paths, and polygons) into the folder to organize your project. To edit a folder's name or description, right-click on the folder in the Places panel, and choose Properties (on a PC) or Get Info (on a Mac).